From early on, I loved the imagery of safety and warmth, the promise of divine protection. But life went on, and Psalm 91 moved out of focus. I returned to it briefly after high school when faced with a new wave of tragedy, and this time found myself disoriented and disillusioned by its words. Whatever promise of “protection” it was offering, wasn’t working for me. 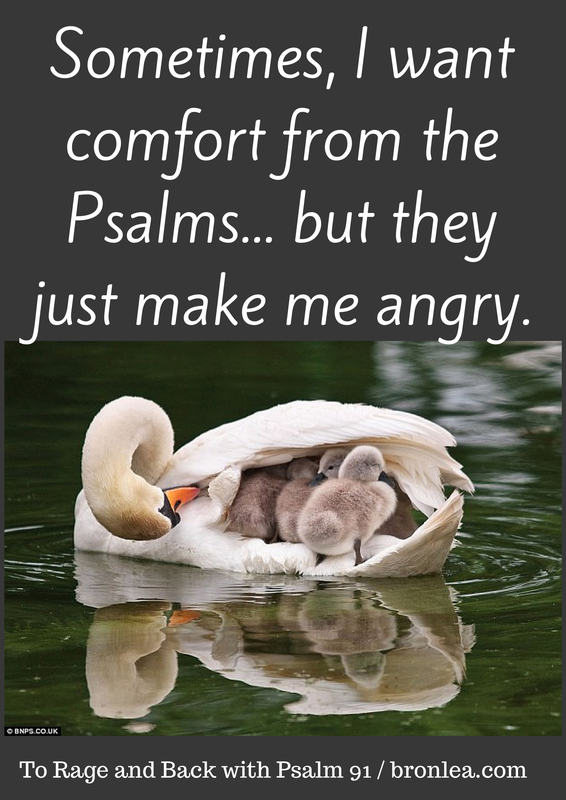 Our family was grappling with loss and violence, depression and hurt – and in my pain I concluded that whatever Psalm 91 may have been promising clearly didn’t avail for me. I mentally filed Psalm 91 in the “things I don’t understand about Scripture” category, and forgot about it. Until recently. In a new bible study group, going through the book of Matthew, we were asked to consider Mary and Joseph’s story. They were young and socially awkward parents (they had a Child Out Of Wedlock! ), and an angel appeared to them telling them that they had to flee to Egypt that very night because Herod was planning to kill the child (Matthew 2:13-15). Trusting the angel’s word, they obediently took flight that very night. I was furious. If people are to claim that they were “protected” from harm because they trusted God, a la Psalm 91 – then, by direct corollary, it infers that those who are not protected were failed by God. If Psalm 91 is interpreted as being disaster-insurance for believers, then when disaster strikes we are left to conclude that either we did not believe enough, or God was unwilling or unable to help. Based on the rest of Scripture and my own experience, I reject all three of those possibilities. But what then of Psalm 91? ‘He will order his angels to protect you. The study guide had us locate each of Jesus’ responses in the Old Testament. Jesus’ reply here came from Deuteronomy 6:16. However, I accidentally misread the cross-reference from verse 7 and looked up the one before instead, which cited the source of Satan’s tempting quote, and discovered that the Accuser was quoting from Psalm 91:11-12. I sucked my breath in as though I’d been punched, and read it again. For here, finally, was a glimmer of understanding for me in my battle with Psalm 91. Satan’s temptation was to quote Psalm 91 literally, and encourage Jesus to use it as disaster-insurance. And Jesus, who embodied and applied and understood the Psalms perfectly, responded with this: don’t put the Lord your God to the test. Whatever Psalm 91 meant, it was not meant to be quoted as a name-it-and-claim-it ticket against disaster. For the truth is that sometimes believers get cancer, they get bullied at school, they starve to death, they get tortured and cheated. The most faithful believer got crucified. And yet Psalm 91 remains true: not an insurance policy against the storm of this life, but an assurance that IN the storms of this life, we have One in whom we can take refuge. When Psalm 91:10 promises that “no harm will overtake you”, it is not saying there will not be harm, but that that harm will not ultimately triumph. We may be afflicted in every way, but we will not be crushed. We may be perplexed, but we will not be driven to despair. We may be persecuted, but we are not forsaken. We may be struck down, but we are not destroyed (2 Corinthians 4:8-9). Psalm 91 no longer makes me angry. I realize that when I am tempted to apply it as a literal type of protection against disaster, that what I am facing is indeed a TEMPTATION. The accuser loves to set us up for disappointment with God. But Jesus tells us we are not to put God to the test in this matter. Rather, we are to take comfort in Psalm 91 as we do in Psalm 23, that though we walk through the valley of the shadow of death, he is with us. He comforts us. I’m 6 again, and curling up under His feathers. This is beautiful. And encouraging. I think I’ll print it and put it in my Bible to refer back to because I am often the one cursing at the ridiculous insurance claims of the bible while surrounded by a world that shows that God doesn’t step in like I’d want him to. Nothing really quells the frustration for me that so much injustice happens and God seems to not care but things like what you’ve written above to help me to remember how to embrace the scriptures that seem to offer insurance policies. I love the way you summed it up: the accuser loves to set us up for disappointment with God. Amen. And Amen. One day. One day, he’ll step in and make it right. But until then, we need each other to keep our eyes focused on Jesus by faith, until the day we see Him face to face. Thank you. Thank you. Thank you. That was JUST what I needed to hear. So, so beautiful! Thank you. I’ve faced times like this in my bible study class as well, and I come home and just rant and rave to Andy about it. I love your analysis and conclusion here, and I really appreciate the heart and passion you put into this post. Thank you for reading and commenting, Ena 🙂 I love meeting friends of friends! I struggled with this for three years after an experience of sexual abuse. I was in ministry in my high school and kept yelling at God, you’re showing up for these people, you claim you love me, so why didn’t you show up for me? He did show up, every time. I just didn’t want to curl up into his feathers. God gives us the freedom to choose. Someone hurt me: his choice. My choice? To curl up in God. But I didn’t, and guess what – I found no peace and was constantly haunted and left unprotected to my fears. When I FINALLY curled up in God’s feathers, I found impossible peace and wholeness. I found full protection. I even found that God could turn me into His wing sometimes and use me to cover and protect others. Wow. We have a glorious, all-loving God! Thanks so much for sharing your story, Liz! Thanks for the analysis tied in so closely with your own experience, Bronwyn. Another thing about Psalm 91’s promise is that the psalm was written by someone with an Old Covenant perspective. Under the New Covenant we now have the Spirit of Christ in us always, so there is never a time when God is not present with us in the most real way imaginable. The psalmist waited for God, while we wait with God. I love that clarification: we wait WITH God rather than for him. Thanks Tim. Love this, Bronwyn. Passed it along to a friend.